Dudley R. Herschbach is a Professor of Physical Chemistry at Harvard University. 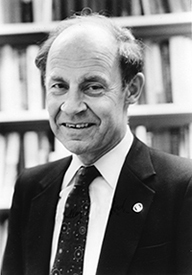 He was awarded the 1986 Nobel Prize in Physics along with Yuan T. Lee and John C. Polanyi "for their contributions concerning the dynamics of chemical elementary processes." June 18, 1932Birth, San Jose (Calif.). 1954Obtained BS in Mathematics, Stanford University, Stanford (Calif.). 1955Obtained Masters in Chemistry, Stanford University, Stanford (Calif.). 1956Obtained AM in Physics, Stanford University, Stanford (Calif.). 1957 – 1959Junior Fellow, Society of Fellows, Harvard University. 1958Obtained PhD in Chemical Physics, Stanford University, Stanford (Calif.). 1959 – 1963Assistant Professor of Chemistry (1959-1951) and Associate Professor (1961-1963), University of California, Berkeley, Berkeley (Calif.). 1963 – 2017Professor of Chemistry (1963-1976); Chairman, Chemical Physics program (1964-1977); Chairman, Chemistry Department (1977-1980); Co-Master, Currier House Chemistry Department (1981-1986); Baird Professor of Science (1976-2003); and Professor Emeritus (2003-present), Harvard University, Cambridge (Mass.). 1964Member, American Academy of Arts and Sciences. 1965Awarded Pure Chemistry Prize, American Chemical Society. 1983Awarded Irving Langmuir Prize, American Physical Society. 1986Awarded Nobel Prize in Chemistry along with Yuan T. Lee and John C. Polanyi "for their contributions concerning the dynamics of chemical elementary processes". 1993Awarded Sierra Nevada Distinguished Chemist Award. 2005 – 2017Professor of Chemical Physics, Texas A&M University, College Station (Tex.). Chemical kinetics and physical chemist. Advised by Herschbach at Harvard University. Advised by Herschbach at Harvard University. Shared 1986 Nobel Prize in Chemistry with Herschbach and Polanyi "for their contributions concerning the dynamics of chemical elementary processes." Shared 1986 Nobel Prize in Chemistry with Herschbach and Lee "for their contributions concerning the dynamics of chemical elementary processes." Advised by Herschbach at University of California, Berkeley. Junior Fellow, Society of Fellows; Professor of Chemistry; Chairman, Chemical Physics program; Chairman, Chemistry Department; Co-Master Currier House; Baird Professor of Science; and Professor Emeritus. Assistant Professor of Chemistry and Associate Professor. Awarded 1965 Pure Chemistry Prize. Awarded 1983 Irving Langmuir Prize. Obtained Masters in Chemistry (1955). Obtained BS in Mathematics (1954). Obtained AM in Physics (1956) and PhD in Chemical Physics (1958). Dimensional scaling in chemical physics/ edited by Dudley R. Herschbach, John Avery, and Osvaldo Goscinski.